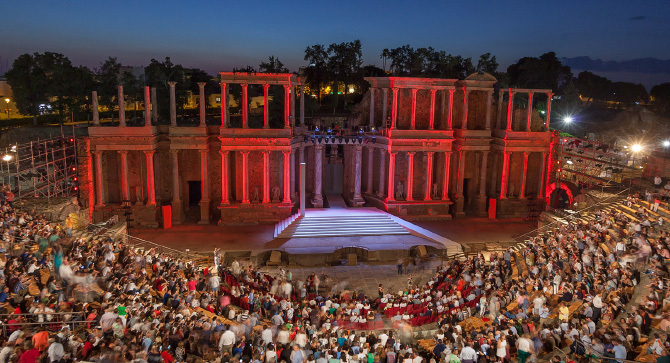 Mérida International Classical Theatre Festival is the oldest classical theatre festival held in Spain and is considered to be the most important of its kind. The festival performances are held annually during the months of July and August at the Roman Theatre of Mérida, considered one of the buildings in the world best representing the solid harmonious shapes and forms of Roman architecture in the times of Emperor Augustus. It is also the oldest working theatre in the world. A total of 63 editions have already been held of the festival, tens of thousands of spectators flocking to each one, making it one of the benchmark theatre festivals in Spain. The Festival began in 1933 with the staging of Seneca’s “Medea”, adapted by Miguel de Unamuno and featuring the actress Margarita Xirgu. After another edition in 1934, as a result of the political tension existing in Spain, it would be suspended for 19 years, until 1953, when it was recovered with the performance of “Fedra” by a university theatre company. In 1954 professional theatre returned to Mérida with the staging of Sophocles’ “Oedipus” played by Francisco Rabal, and since then it has been held every single year, its two-thousand year old stage playing host to the performances of major Greco-Roman Classical Theatre works. Jesús Cimarro, with his company Pentación Espectáculos, has directed and managed the festival since 2012 until today. Pentación Espectáculos was awarded the direction and management of the Festival during 2016, 2017 and 2018 by the Extremadura regional government through public tender. Editions 58, 59, 60, 61, 62 and 63 have managed to recover local audiences and the influx of spectators from the rest of Spain has been consolidated, making this event one of the three most important and highest-impact summer cultural events, according to the national media. 83 years ago the actress Margarita Xirgu resumed a task that had started over 20 centuries ago: that of performing the great Greco-Roman comedies and tragedies on these ancient stones, a witness of honour in the history of performing arts. The most renowned theatre professionals – actors, actresses, musicians, directors, authors, lighting technicians, costume and set designers – both national and international- have all set foot on its stage over the 63 editions, becoming part of its history.